13 April 2010, at 7:33a.m. IRELAND - The Minister for Agriculture, Fisheries and Food, Brendan Smith TD, yesterday advocated "a new coherent animal health policy - one that is more flexible, risk-based, prevention-orientated and enshrined in modern law." The Minister was speaking at an All-Island Animal Health and Welfare Conference in Co Cavan, where he was joined by the EU Commissioner for Health and Consumer Policy, John Dalli, and the Northern Ireland Minister for Agriculture and Rural Development, Michelle Gildernew MLA. 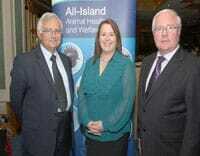 Minister Brendan Smith TD, joined by the EU Commissioner for Health and Consumer Policy, John Dalli, and the Northern Ireland Minister for Agriculture and Rural Development, Michelle Gildernew MLA at an All-Island Animal Health and Welfare Conference in Co Cavan. Referring to the agreement on an All-Island Animal Health and Welfare Strategy, Minister Smith said that its "ultimate objective is to have policies and arrangements in place that will facilitate the free movement of animals on the island." Drafting of an Animal Health and Welfare Bill is progressing and the Minister intends to bring proposed Heads of the new Bill to the Government at an early date. The legislation will amend and consolidate legislation in the area of animal health, particularly to reflect the changed disease status of Irish farm animals. Existing legislation will also be updated to ensure that the welfare of all animals, including non-farm animals, is properly protected and that the penalties for offenders are increased significantly. The Bill will also provide any necessary statutory basis to give effect to the commitment in the Programme for Government that the responsibility for the welfare of all animals (including non-farm animals) will be consolidated in the Department of Agriculture, Fisheries and Food. Speaking about a number of specific animal health issues, Minister Smith identified the "landmark achievement of Official Brucellosis Free status for Ireland last August" as well as "the significant progress made towards the objective of officially eradicating Aujeszky's Disease from the national pig herd." Minister Smith also acknowledged the successful co-operation between the Departments North and South "in response to the evolving disease risk situation over the years" and expressed his satisfaction at the development by the two Departments of "a common chapter in our respective contingency plans for serious diseases for dealing with three diseases - Foot & Mouth, Avian Influenza and Bluetongue." Expressing his appreciation to those attending yesterday's conference, the first of its kind, the Minister concluded by saying, "I have every confidence that your participation at this event at the start of a new decade is a tangible contribution to the development of closer links and joint approaches for the improvement of animal health and welfare on the island of Ireland."